As Iraq's Leader Meets Obama, Here's Why The Stakes Are High : Parallels Violence is rising again in Iraq, with at least 5,000 people killed this year. Prime Minister Nouri al-Maliki wants U.S. military hardware to fight back. He's also seen as a key figure when it comes to developments in Iran and Syria. 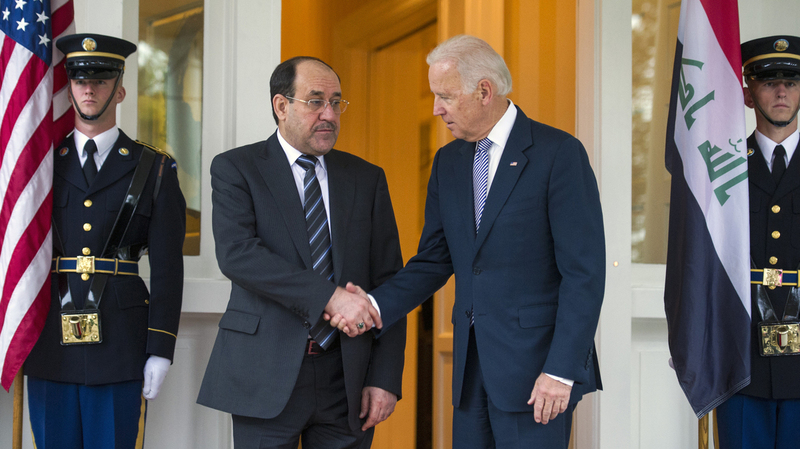 Iraqi Prime Minister Nouri al-Maliki is welcomed by Vice President Biden in Washington on Wednesday. Maliki is asking for U.S. military hardware to fight radical groups behind a recent surge in violence in Iraq. Iraqi Prime Minister Nouri al-Maliki last came to the U.S. in 2011 as American troops were pulling out of his country. But with violence again on the rise in Iraq, there's much at stake as he prepares to sit down with President Obama at the White House on Friday. There's been a wave of attacks by al-Qaida-linked Sunni militants against the majority Shiite population. Casualty levels aren't as high as they were in 2007 at the height of the country's civil war, but they threaten to reignite a repeat of that sectarian bloodletting. At least 5,000 people have been killed this year, according to counts by Agence France-Presse and the United Nations. The violence is driving the discussion. Maliki says this is why the United States needs to help him take on a common enemy — al-Qaida — by selling more sophisticated weapons to Iraq, including military helicopters and jets. Iraq has made a down payment for F-16s (which usually have to come with American trainers). Maliki outlined the argument in a column Tuesday in The New York Times. And in a speech Thursday at the U.S. Institute of Peace, he said, "We will defeat the terrorists through our local efforts and our partnership with the United States." The U.S. withdrew from Iraq two years ago in part because Maliki would not agree to grant immunity from Iraqi law to American soldiers stationed there. At the time, many Iraqis were fed up with civilian casualties and blamed the U.S. forces. Now Maliki is asking for U.S. muscle but specifying that he is not requesting troops, just equipment. Still, the requests raise concerns about just what he'll do with more firepower. Maliki has won two elections by riding the support of the majority Shiites, and he is fiercely sectarian — in part because Shiites suffered badly under Saddam Hussein's mostly Sunni rule. Maliki has jailed Sunni politicians, and the Sunni vice president fled the country when he faced murder charges that eventually led to a conviction in absentia and a death sentence. Several U.S. senators wrote an open letter to Obama on Tuesday saying that U.S. support should be contingent on Maliki's willingness to shed his authoritarian tendencies and share power with Sunnis. The Senate letter also urges Obama to push for assurances that next year's Iraqi elections will be fair and free. Some speculate that Maliki might ask Obama for tacit American support in his expected bid for a third term. Retired Gen. David Petraeus, who oversaw the troop surge in Iraq in 2007 and 2008, paints a picture of Maliki as "courageous" and cooperative — to a point — in a piece on ForeignPolicy.com. Petraeus warns that gains made in Iraq by U.S. troops are in jeopardy unless sectarian tension is reduced. But the scope of Maliki's visit goes far beyond just Iraq and its relationship with the U.S.
Iraq is both an ally and a contentious next-door neighbor to Iran. Many blame Maliki for letting Iran have too much influence in his country. This includes things like allowing Iran to use Iraq's airspace to fly support to President Bashar Assad's regime in Syria. But Maliki also bristles at Iranian attempts to control him and likes to pit Washington against Tehran, taking counsel from both, seeing who will give him the best deals and hoping to find an independent route between them. In his commentary, he calls the U.S. "our security partner of choice." And that raises Syria, another regional concern sure to come up at the White House meeting. Maliki is thought to oppose toppling Assad, who is a close Iran ally. And U.S. officials have pressured Maliki to prevent Iran from using Iraqi airspace to fly supplies to Assad. But Iraqis note that they aren't equipped to enforce their airspace. And that, Maliki writes, is why he needs the American fighter jets.